The services Mr. McLoughlin provides to his diverse clients include: complex business litigation; corporate investigations; securities litigation and arbitration; class action litigation; and criminal defense. 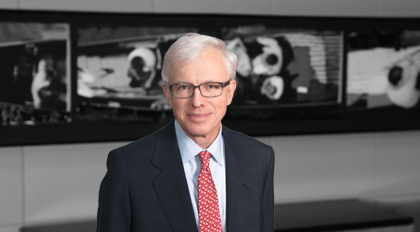 Mr. McLoughlin has extensive litigation and arbitration experience, including arbitrations before the NASD, the NYSE, the American Arbitration Association, and the International Chamber of Commerce; trials and appeals in numerous states; and international matters. Mr. McLoughlin is currently representing clients under investigation related to financial matters by the Department of Justice, the SEC, the CFTC, the North Carolina Attorney General, and other U.S. agencies, as well as the U.K. Financial Services Authority. He assists a client with the management of its litigation portfolio, including tax, civil, regulatory and labor matters in South America. He recently represented a healthcare company in the defense of an anti-trust class action in Arizona arising from alleged price-fixing by hospitals in the hiring and payment of hospital staff. In 2009, Mr. McLoughlin represented a defendant in a federal criminal fraud case arising from a multi-national, multi-million dollar telephone sweepstakes fraud. After conducting an internal investigation of a whistleblower’s allegations of misconduct, he won an arbitration defending a client against multi-million dollar Sarbanes-Oxley and state law claims brought by the terminated employee, who alleged he was terminated because he was a whistleblower. He represented the Bank of America Corporation in connection with the investigation of that corporation's merger with Merrill Lynch and related matters by the Attorney General of North Carolina. Representing a public company client in an investigation by the SEC and others arising from the company’s restatement of earnings. He supervised and conducted an internal investigation for a health care client during the sale of one of its operations when allegations of fraudulent recognition of revenue and lack of internal controls were made in the division to be sold. He conducted an internal investigation of a public company client’s securities reporting and management procedures when the company determined unregistered shares had been sold to the public, and the resolution of those issues with the SEC. He conducted an internal investigation in response to an SEC investigation regarding allegations of insider trading by a public company’s CEO. Mr. McLoughlin conducted an internal investigation in response to allegations an employee of a financial institution was embezzling. That investigation led to civil and criminal charges against the employee. Recently, Mr. McLoughlin supervised an internal investigation on behalf of an international medical device manufacturer into allegations individuals affiliated with the company endangered patients’ safety in procedures conducted outside the United States as the result of the knowing misuse of certain medical equipment. Representing the defendant in the first criminal fraud case brought by North Carolina state authorities related to cryptocurrencies. Representing the defendant against a multi-count indictment alleging international money laundering and immigration fraud arising from alleged illegal bribery and extortion in Russia. Co-counsel in representation of the Transaction Committee of the Board of Directors of Reynolds American, Inc. in connection with the acquisition by British American Tobacco p.l.c. Principal counsel for a major international bank in response to the regulatory investigations in the U.S., Europe, and Asia-Pacific related to LIBOR and other reference rates. Principal counsel for a major international bank in response to the regulatory investigations in the U.S., Europe, and Asia-Pacific related to foreign exchange trading. Representing Royal Bank of Canada in In re Foreign Exchange Benchmark Rates Antitrust Litigation, U.S.D.C. S.D.N.Y Case No. 1:13-CV-07789-LGS. Conducted a multi-jurisdictional international investigation on behalf of a client to respond to international regulatory inquiries regarding the Panama Papers. Successfully represented independent directors of Reynolds American in the North Carolina Business Court and in the North Carolina Court of Appeals arising from the acquisition of Lorillard by Reynolds American obtaining a dismissal of the case against them. For Rexam, Inc. led the successful prosecution of one of the few defendants’ class actions over the vesting of certain benefits under ERISA in U.S. district courts in Minnesota, Ohio and California. Won a jury trial in the North Carolina Business Court on behalf of a minority shareholder claiming breach of fiduciary duty, breach of contract and theft of corporate assets. Represented a national healthcare company in the defense of an anti-trust class action in Arizona arising from alleged price-fixing by hospitals in the employment of hospital staff. For many years has assisted an international bank client with the management of its litigation portfolio, including tax, civil, regulatory and labor matters in South America, particularly in Brazil and Argentina. Won an arbitration defending a client against multi-million dollar Sarbanes-Oxley and state law claims brought by a terminated trading employee who alleged he was terminated for whistle-blowing. Successfully represented a client in an investigation of sales practices of placement agents in dealings with state pension officials. Represented the Bank of America Corporation in connection with the investigation of that corporation's merger with Merrill Lynch by the Attorney General of North Carolina. Conducted a successful, accelerated internal investigation of possible fraud in a client's division to preserve the sale of the division. Represented one of two defendants in the first anti-terrorism jury trial after the tragedy September 11.